You are currently viewing an archived version of Topic GIS&T and Marketing. If updates or revisions have been published you can find them at GIS&T and Marketing. Miller, F. (2018). GIS&T and Marketing. The Geographic Information Science & Technology Body of Knowledge (2nd Quarter 2018 Edition), John P. Wilson (Ed). DOI:10.22224/gistbok/2018.2.2. This entry was first published on April 26, 2018. No earlier editions exist. Environmental scanning: Comprehensive exploratory research of the major factors affecting the market for a good or service, typically including social, cultural, economic, technological and regulatory factors. Marketing mix: The combination of the four P’s of marketing (product, price, place [distribution] and promotion [communication]) designed by marketing managers to establish mutually beneficial relationships with specific target markets. Market segmentation: The process of subdividing customers in a market into distinct subgroups with similar attributes such as demographic, psychographic or behavioral characteristics. Customer profiling: The process of determining or inferring the distinctive characteristics of an enterprise’s best customers in order to serve them better and/or to identify clusters of potential new customers. Retail management: The organization and implementation of strategies for selling goods or services to households and/or individual consumers, either through a physical store or other, often electronic, means. Site selection, merchandising and Indoor GIS are major components. Site selection: The process of determining the best location or locations for enterprise facilities. In marketing, these facilities are most often retail stores, distribution centers, sales offices or customer service centers. The American Marketing Association defines marketing as “the activity, set of institutions, and processes for creating, communicating, delivering, and exchanging offerings that have value for customers, clients, partners, and society at large." For many enterprises, the strategic goal of both business and consumer marketing is to pursue such exchange activities within the context of long term, mutually beneficial relationships with these constituent groups (Palmatier, 2008). Tactically, marketers pursue this objective by identifying the groups the enterprise is striving to serve, developing offerings which match their needs, and establishing exchange relationships which satisfy those needs while accomplishing enterprise objectives of profit, service and/or social impact. In these effort, marketers use the marketing planning process to identify and exploit opportunities. This process includes scanning the relevant environment for opportunities, selecting target markets with unmet or insufficiently met needs and designing marketing mix strategies to serve them. Marketing mix strategies are combinations of the traditional four P’s of the discipline, Product, Price, Place (distribution) and Promotion (communication), designed to appeal to the target market. Delivery of marketing mix strategies relies on tasks such as marketing research, market segmentation and customer profiling, all of which GIS supports. In addition, specialized marketing functions and emerging technologies also benefit from location analytics resources. Integrated data which provides access to continuously updated demographic, lifestyle, business, consumer survey and purchasing data within online systems. Integration of these resources with enterprise data extends their value even further, as does the availability of data for multiple countries. Advanced online analytical tools which enable enterprise users to perform insightful analyses in their online systems and share them across their organizations. Configurable Web apps which allow experienced GIS professionals to design applications for use in the office or in the field. These apps enable inexperienced users to perform sophisticated analyses in the field on mobile devices and to integrate their work with enterprise information systems. Four key ways in which GIS&T plays a role in marketing planning include relationship marketing, environmental scanning, target market selection, and marketing mix design. 4.1 Relationship marketing: Establishing and managing mutually beneficial exchange relationships with enterprise customers is a core strategic perspective of marketing in both business and consumer marketing. Many firms use customer relationship management (CRM) systems in this process. Locational information, enriched customer data, and analysis of customer mobility are significant locational components of such systems. 4.3 Target market selection: GIS-derived demographic, lifestyle and purchasing data enhance marketers’ ability to segment markets and to select attractive target markets. Color-coded mapping, spatial and attribute queries can then locate geographic concentrations of those target customers. Marketing research gathers and analyzes information on relevant market factors including economic conditions, competitors, partners, consumers and their buying behavior. GIS systems support this function with online survey systems, relevant data, and spatial analytical functions to augment traditional marketing research tools. Enterprises base segmentation strategies on several factors including demographics, location, purchasing patterns, values, and lifestyle. Collectively, these contribute to market segmentation. Online GIS systems provide data to support all of these approaches. Additionally, after target segments have been defined, color-coded mapping, multi-attribute queries, and analysis tools can reveal clusters of those segments in relevant markets. To create customer profiles, enterprises use internal customer data, survey data and/or data inferred from customer location. These data are then summarized to create demographic and lifestyle profiles of existing customers. The profiles are then used to increase sales to existing customers (market penetration) and to attract similar new customers in other areas (market expansion). The data enrichment capabilities of online GIS provide data to support this process. The field of marketing relies heaving on geospatial information and its approaches and technologies in several specialized ways, including site selection, merchandising, indoor GIS, sales territory design, and routing of shipments, sales forces, and service calls. 6.1 Site selection is used to determine the optimal locations for enterprise facilities of all types. Internal real estate planning units often manage these decisions, many of which are outside the marketing function. Within marketing, this process focuses on distribution centers, sales offices, and service centers with the objective of maximizing coverage most efficiently. It is also applied to customer contact points such as stores, markets, and ATMs, with the goal of selecting the sites most attractive to target consumers. Enterprises with no customer data create market areas around potential sites with simple rings or relevant travel time polygons. Enterprises with customer data can define market areas based on concentrations of customers, number of purchases, or sales value. In both cases, analysts use GIS tools to create these polygon areas, enrich them with selected demographic, lifestyle, and purchasing data, and generate maps and reports to communicate relevant characteristics. They then compare market areas to identify locations which best serve enterprise objectives. In more complex analyses, enterprises use modeling tools to assess the impact of competitors and estimate revenue, market share, and profitability. The long-popular Huff Model (Huff, 1964) posits that retail gravity is inversely related to distance. It has been extended to include factors such as store characteristics, consumer preferences, survey data, and buying behaviors. More elaborate modeling techniques extend this approach by creating customized analyses based on enterprise customer profiles and marketing strategies. For example, see Suárez-Vega et al (2012). 6.2 Sales territory design divides the geographic area covered by a group of sales representatives into discrete territories. Ideally, territories will be balanced in terms of workload and sales potential. These factors affect reps’ performance, efficiency, and motivation. GIS tools facilitate initial design schemes and enable subsequent adjustments to reflect desired design changes. These tools can also be used to evaluate and adjust existing systems as needed, taking into account the risk of disrupting established customer-sales rep relationships. Not all enterprises employ a sales force which calls on prospects, but those which do must manage this resource to enhance sales and service. Sales management is a complex task which includes recruiting, training, motivating, and compensating. The major GIS contributions lie in the design of sales territories and the routing of sales and service calls. 6.3 Indoor GIS is used by retail enterprises to support research projects and provide customer service. Tracking customers through shopping experiences provides insight into how they search, evaluate, and compare alternatives in purchase decisions. Additionally, store specific mobile apps provide information to customers about product location, prices, and discounts, and also the opportunity to influence on-site buying behavior with customized incentives. 6.4 Merchandising refers to the assortment, presentation, and pricing of goods and services in a retail (bricks and mortar or online) setting. Lifestyle data extracted from online GIS systems allow retail managers to tailor the merchandising strategies of individual stores to the lifestyle segments of their market areas (Thompson Merchandising podcast, 2014). Similarly, manufacturers use proprietary or third party survey data to help distributors, dealers, and retailers adjust their product assortment to local demand preferences. Suppliers can also use these data to help manufacturers adjust production to local demand. 6.5 GIS&T are integral to the routing of shipments, sales force, and service calls. Supply chain management (SCM) systems track and manage the movement of raw materials, components, and final products throughout the system. The same tools are used to route sales calls as well as maintenance and service calls by enterprise technicians. Simple systems create daily maps and instructions based on known traffic patterns, customer requirements, and sales/service personnel skills. More advanced systems monitor fleet activities in real time and adjust scheduled routes based on current traffic and weather conditions, disruptive events, diversions from scheduled call times, and emergency calls from important customers as they arise. 7.1 Big data, the Internet of Things, and digital tracking of customer activities refer to the myriad of Internet-enabled devices, tracking systems, and streaming data currently available to enterprises. These systems produce very large datasets of discrete observations of phenomena ranging from weather events to consumer movements, communication, and consumption patterns. GIS technologies allow these data to be displayed and summarized geographically, revealing underlying patterns in the data. For example, anonymous tracking of mobile phone locations enables a shopping center to discern which households in its market area are actually visiting the center. Similarly, tracking consumers’ physical and virtual shopping patterns can help retailers determine which incentives motivate customers to make purchases or continue searching. 7.2 Social, local, mobile (SoLoMo) marketing and geo-triggered marketing applications integrate the communication tools of social media with the immediacy of mobile device apps in the specific locations where consumers are shopping. They are excellent marketing tools as they allow enterprises to interact directly with potential customers in real time as they make decisions. Geo-fencing and geo-triggering tools allow enterprises to message potential customers with social media content and incentives when they enter the space near a sales location (Spann, Molitor and Dauerer, 2016). Such incentives can motivate desired responses by consumers and also provide continuous data on the most effective incentives. Authoring project reports and graphics: This is the traditional role of GIS professionals in most enterprises. It involves research projects, executed primarily on the desktop, resulting in project reports to managers and supporting graphics for communications purposes. While still a part of the GIS professional’s life, this role is gradually giving way to new responsibilities. Authoring and sharing online maps with diverse enterprise interest groups: This role is the result of distributed, online access to GIS tools in enterprise systems. In this context, GIS professionals author maps with appropriate functionality and share them with other professionals across the enterprise. By creating groups of users with similar responsibilities, GIS professionals can tailor the design of these resources to the specific needs of those users, while limiting access to sensitive data. Designing Web apps for communication purposes: This function enables GIS professionals to integrate the communication power of maps with multimedia materials and linked Web resources. These apps allow deliver complex, data driven stories in a rich communication environment via Web sites and/or mobile devices. With moderate levels of training, including the online options cited below, other organizational users can also perform these functions. Designing Web analytical apps for the field: While disseminating Web-based resources supports office users, many organizations also enable GIS-based tasks for staff in the field, consumers, citizens or other users. To support this capability, GIS professionals develop Web apps with analytical capabilities customized for the needs of specific users. These apps are distributed through a variety of mobile devices and used in the field to perform analysis or gather information. Data thus collected is then integrated into enterprise databases either directly or in batch processes. Figure 1. 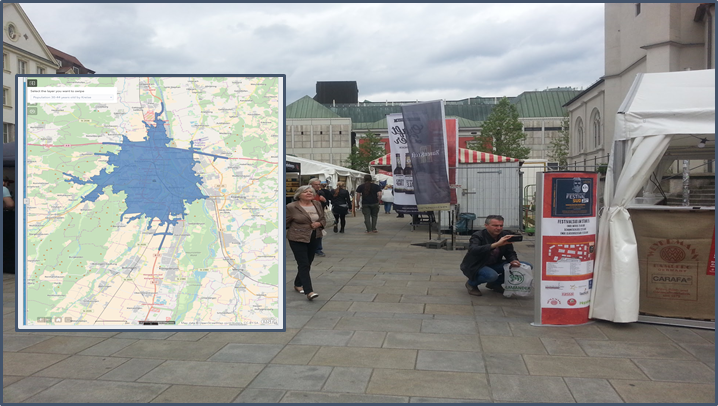 Example of using geospatial information and technologies in the field of marketing. As an example, Figure 1 illustrates several of these capabilities and resources. It portrays an available site in a central urban square and, on an iPad Pro in the foreground, the trade area for this site, which was created in real time on the device. The application uses a basemap and boundary layers from online sources. The boundary layers are enriched with online demographic and purchasing attributes visible in maps, tables, and pop-ups. It includes market areas created with online analytical tools and enriched with similar data. It allows users to access lists of available properties and to define and enrich their market areas in the field. Finally, this app works on multiple mobile devices, enhancing the ability of users to integrate these data, analysis, and direct experience in the field. Kotler, P., and Keller, K.L. (2015). Marketing Management, New York, NY: Pearson, 15th edition. Suárez-Vega, R., Santos-Peñate, D.R. and Dorta-González, P. (2012). Location models and GIS tools for retail site location. Applied Geography, 35(4), 12-22. Describe the enabling technologies that have accelerated the adoption of GIS in marketing and explain their impact. Describe how marketing managers use marketing research, market segmentation and consumer profiling to identify and exploit market opportunities. Explain how location analytics resources support these analytical processes. Identify and describe three specialized areas in marketing in which GIS resources are useful. Explain the application of location analytics tools in each. Describe how big data, continuous data tracking and streaming, the Internet of things (IoT) and SoLoMo marketing have enhanced enterprise knowledge of current and potential customers. Explain how location analytics tools have contributed to these technologies. Describe how the role of the GIS professional in supporting enterprise marketing efforts has expanded. Explain how the enabling technologies and location analytics resources described here have enabled that expansion. What are three enabling technologies which have accelerated the adoption of GIS tools in marketing? In your response, explain the contribution of each to the discipline. How do marketing research, market segmentation, and consumer profiling enable marketers to understand and target consumers more fully? Can you describe three online GIS resources which support these activities and how they contribute to them? What are three specialized marketing functions in which GIS resources are useful? For each, describe one supporting location analytics tool and explain its value. How have big data, continuous data tracking and streaming, the Internet of things (IoT) and SoLoMo marketing enhanced enterprise knowledge of current and potential customers? Identify and describe two location analytics tools which support these technologies. How has the role of the GIS professional in supporting enterprise marketing efforts expanded? How have the enabling technologies and location analytics resources described in this topic enabled that expansion? You are a GIS professional in a consumer products enterprise. Write a 1.5 to 2 page memo to the Chief Marketing Officer explaining how emerging location analytics capabilities can enhance the firm’s marketing programs and how you can support those efforts by disseminating location analytics resources across the marketing organization.